Skate and Read with the Spartans! On Saturday, September 22nd, Phelps Helps teamed up with the elite Stanstead College Hockey players for SKATE & READ with the SPARTANS! This was an exciting event to promote family literacy and provide free skating lessons. 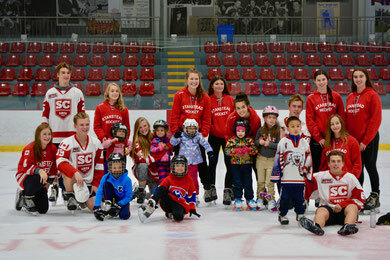 We had 43 elite hockey players volunteer at the event hosting a variety of activities for local families. Educational games were set up for all levels, from toddler to adult. The Story Corner was a fun space for our younger participants who joined the Spartans for a read-aloud of ‘The Rainbow Fish’. Our Health Bar featured a smoothie tasting of four different recipes invented by the Spartans, including one mystery smoothie that had participants guessing its ingredients. Also included in the Health Bar was guided yoga for all levels- even the mascot Sparty gave it a try! Last but certainly not least, the elite skaters paired themselves with the participants to allow for one-on-one skating lessons. A big thank you to Stanstead College for their continued support and use of their facilities and players for this event. A reminder that on October 3rd from 5:30-6:30, Phelps will be holding an Open House. This is an opportunity for anyone to drop by to meet our staff and volunteers, see our renovations, and learn about our 9 programs. We hope to see you there!